I’ve always wondered why big-power rotary tuners always picked older engines from the last RX-7 rather than the Renesis engine from its RX-8 successor. Newer is better, right? As it turns out, that’s not exactly the case. If I want information about rotary engines, I tend to go looking for videos from the Australian or Kiwi scenes. That’s where rotary culture is at its strongest (at least within the english-speaking world) and for some reason the biggest and baddest Wankel builds all seem to come from there. So it’s no huge surprise that the mega bros of Fullboost did this video on why the Mazda RX-8's rotary is so often left behind and tuners tend to turn to its predecessor. For the purposes of this post, I’ll just call that the 13B and the RX-8 engine the Renesis, though technically the Renesis is a 13B-MSP, standing for multi-side port, a problem that will come up. In dealing with a lot of these engines, these guys found that the later RX-8 engine housings tended to be of lower quality, showing warping after lots of use. A 13B might get to re-use its rotor housing on an engine rebuild; a Renesis driver would not be so lucky. Looking at the rotor for an RX-8's Renesis engine looks better than the 13B’s. The later engine has more openings in its plate. That’s the Renesis on the left, the 13B on the right. It works for the earlier stuff; why not the later? Well, the earlier engines have a clear and easy exhaust exit in the rotor housing. The Renesis engine, locating that exhaust exit within the plate, requires the exhaust gas to turn to get out of the engine, a more difficult path. The Renesis engine is basically choking itself, apparently in the name of emissions compliance. A later engine indeed. Between the bad exhaust routing and the poor housing build quality, you would need very good seals to keep everything clean and separate inside the rotary engine itself. As Engineering Explained noted in his old rotary engine shortcomings video, the rotary engine needs good seals as one half of the engine is always heating up after combustion in relation to the other half expelling exhaust and intaking air. It’s always trying to warp itself, so it needs good seals. 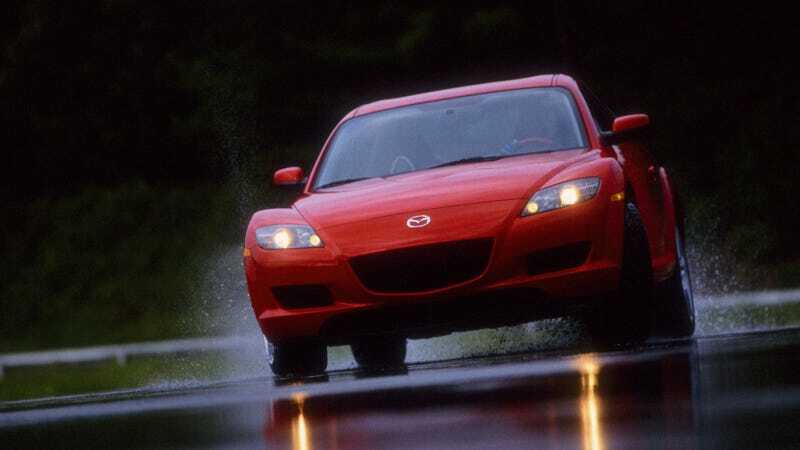 But the apex seals in the RX-8's engine are thinner and poorer than the ones in the RX-7's 13B. They are lighter so they work better at high RPM, but they pose big reliability problems. The problems with the skinny apex seals and poor housing build quality are doubly true when forced induction joins the fray. Boost a Renesis rotary and everything that went wrong even when naturally aspirated gets exacerbated. The earlier 13B engines are tougher, while the later Renesis ones are more frail, if quieter and more emissions-compliant. So the later RX-8's engine got the car through tougher emissions standards and was quieter and more civilized than its predecessor, the 13B. But that older engine was better made (it hailed from a time of the Bubble Era, not unlike the Toyota 2JZ) and responds better to big power changes as well as rebuilds. I guess it’s no surprise then that tuners pick the older choice. The question remains why Mazda couldn’t make the later engine not only more efficient than the earlier one, but just as tough as well. I’ll ask Mazda next time I talk with them, as I’m sure they had good reasons for it. For now, though, I will have to continue to cast shame at the vile RX-8's engine, hurling curses why such a nice chassis got hobbled by such a weak rotary.